One of the best ways to prepare your children for a long and healthy life is to get them started early with their own healthy habits. This is best taught by example. When the entire family practices healthy habits, they’re more likely to stick with your children for life. Drink water. Most of us just don’t drink enough water. Sure, we’re hydrated but it’s often with calorie and sugar heavy beverages. Skip the soda, juice and sweetened drinks and stick to water. It may be a tough transition for the entire family. Make the change gradually. Consume far less during mealtime. We’re a super-sized society. We’re accustomed to eating a lot during mealtime. Work on eating smaller portions during mealtime. Serve more vegetables on the plate and less protein and starchy carbohydrates. Move your body Find a way to be active each and every day. Walk or bike to places when you can. Take hikes and family walks together. Play sports or engage in physical activities. The more you’re active as a family and on your own, the more your children will be active too. An active lifestyle is key to a healthy mind and body. Appreciate food for what it is. There’s nothing wrong with enjoying food and consuming treats in moderation. When people have a healthy appreciation for food, they eat healthier. However, when they use food to soothe their emotions or as a reward, it creates a misguided relationship with food. Children will learn to turn to food as a coping mechanism. Parents can help by not using food as a reward or punishment. Make more food at home. Takeout and prepackaged foods are sometimes necessary, but they’re usually not healthy. However, when a family makes food at home using fresh produce they’re more likely to eat healthy and to develop a healthy relationship with food. Make cooking a family activity on the weekends when everyone is home together. Eat less sugar. Sugar is in just about everything we eat. It’s in bread, sauces, it’s sometimes even in lunch meat. Help your family break the addiction to sugar by choosing low sugar and no sugar options. Cookies and snacks are okay occasionally but they shouldn’t be an everyday choice. One of a parent’s most important responsibilities is to be a good role model. As your child grows they’ll learn about healthy habits from you. They watch, they emulate and they adopt your habits. 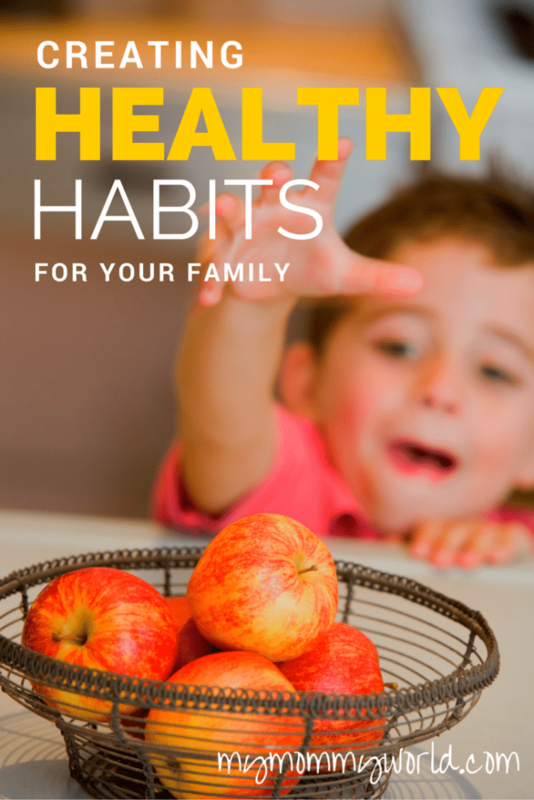 Creating healthy habits as a family will help your children grow up healthy and strong. They’ll take the habits they learned as children into adulthood. If you would like to learn more about the habits of healthy families, sign up for the Healthy Living Mini Audio eCourse (affiliate link). It’s totally free to sign up, and you get 4 lessons by some of the biggest names in the blogging world to help you make a change in your health habits. The course is only available until September 6, 2015 so make sure you don’t miss it! Hi Erin! I don’t have a treadmill desk but we are able to sit a laptop on top of the treadmill as we walk. 🙂 We just try to be careful and haven’t had any accidents. These are great tips. I know we always serve water with meals and drink water in between meals too. We’ve gotten so used to it, it seems weird to drink anything else with our meals. Love all these tips, Erin. Also, loving the look of the blog!